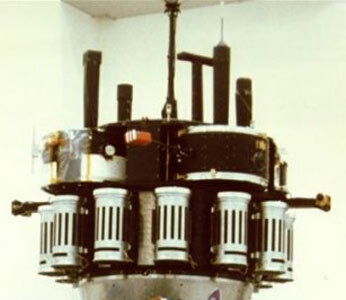 The Firewheel spacecraft was designed to make barium and lithium ion releases in the night magnetosphere at 9.5 and 7 Re, respectively, and over North and South America. The main spacecraft was to carry 12 ejectable ion release containers. Diagnostic measurements were to be made on the main spacecraft and on four ejectable sub-payloads. These sub-payloads total approximately 200 kg (~50 kg each). Optical measurements were to be made from the ground and from aircraft. tracing of acceleration and redistribution of the injected ions in the inner magnetosphere. The spacecraft would have been battery powered, with a lifetime of less than 48 hours. Firewheel was lost in the launch failure of the second Ariane-1. The technology developed for Firewheel was utilized some years later in the interantional AMPTE mission, especially with the German component IRM (AMPTE 3).